Well known as photographer of student life, Ed “Flash” Roseberry (Com ’49) provided a low-tech version of Facebook for the University more than a half century ago. 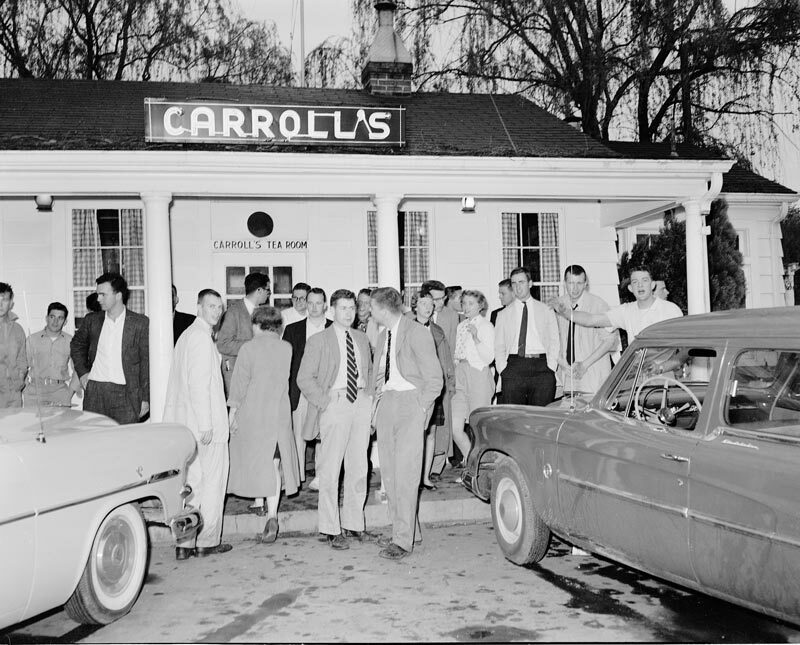 After big weekends, Roseberry would post pictures of the proceedings in the windows of Eljo’s on the Corner, where students would crowd around to see photographs of their hijinks from the past several days. 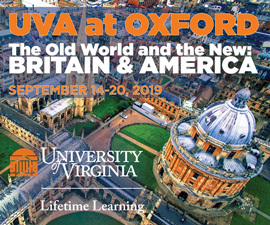 But Roseberry’s camera recorded much more than just life at UVA. 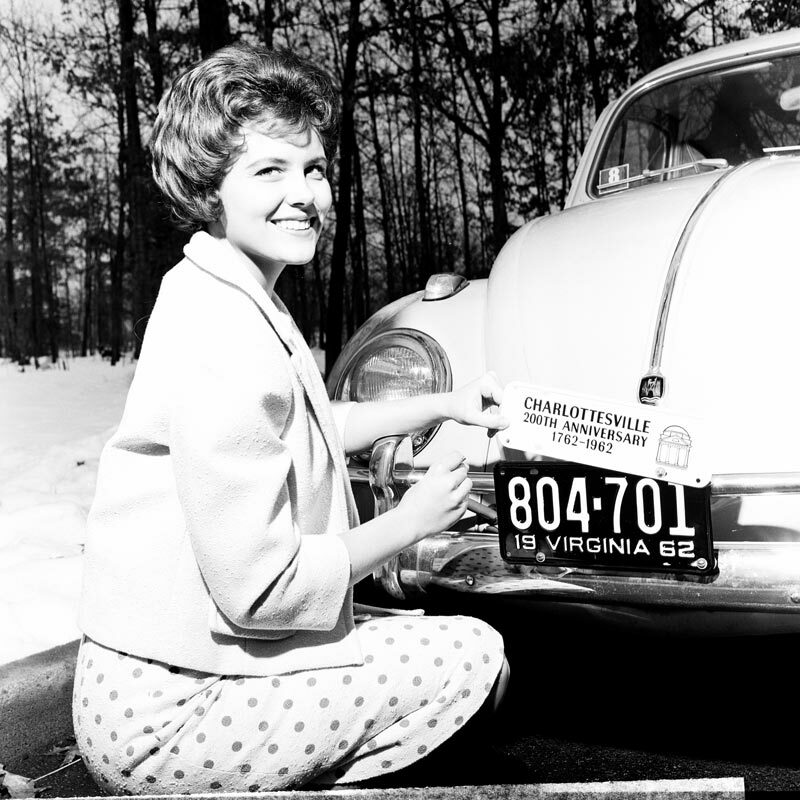 For decades, Roseberry was a ubiquitous presence around Charlottesville, documenting the people and the changing landscape of a growing city. 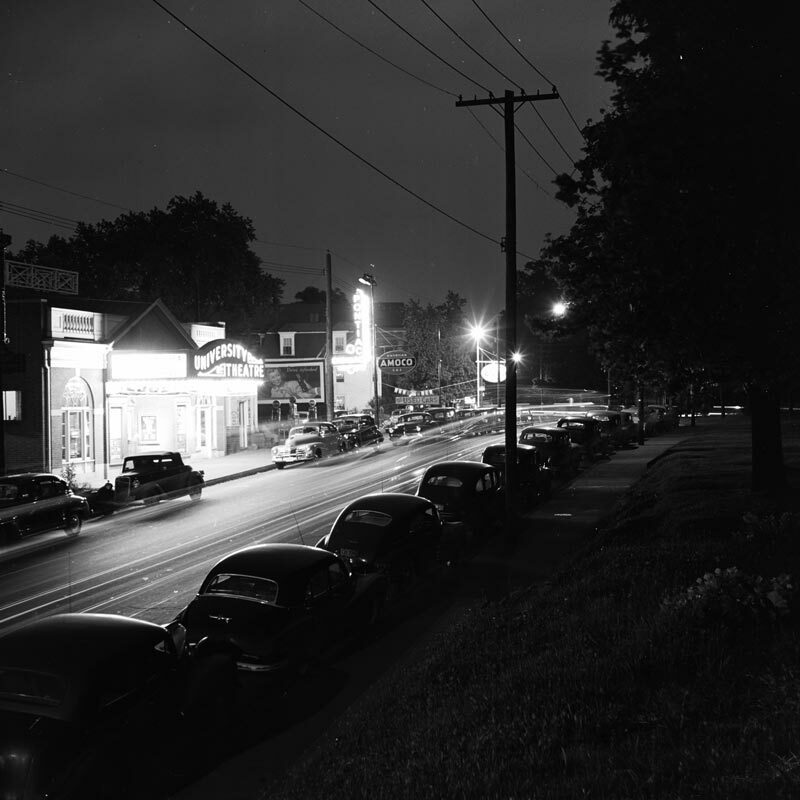 From favorite watering holes to the opening of Barracks Road, Roseberry and his camera saw it all. 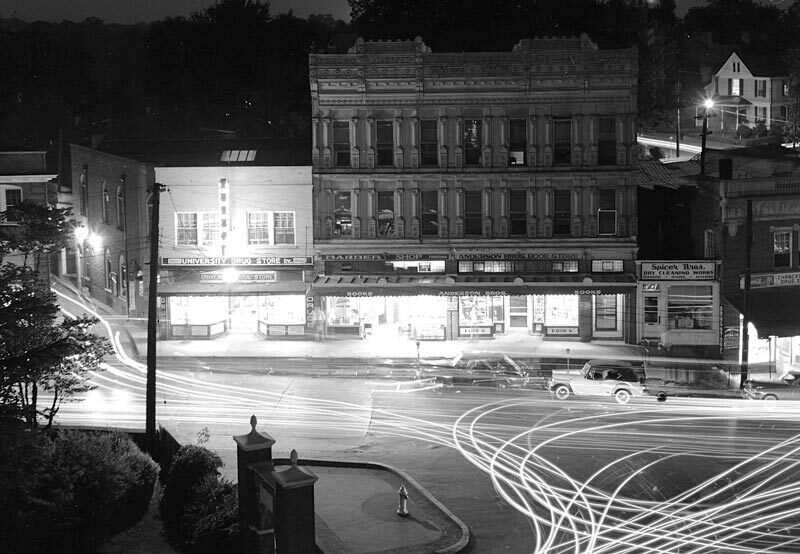 What follows are just a few of the thousands of photographs he took of Charlottesville, along with recent commentary from Roseberry, now 88. 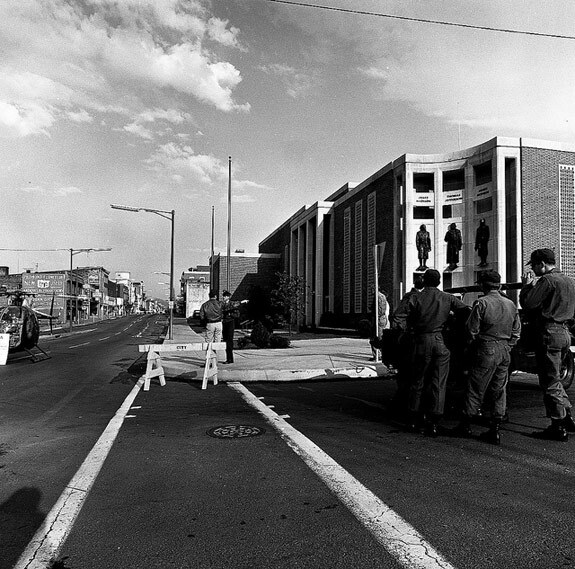 Historian Coy Barefoot interviews photographer and alumnus Ed Roseberry. These buildings are located across from University Hall and John Paul Jones Arena. 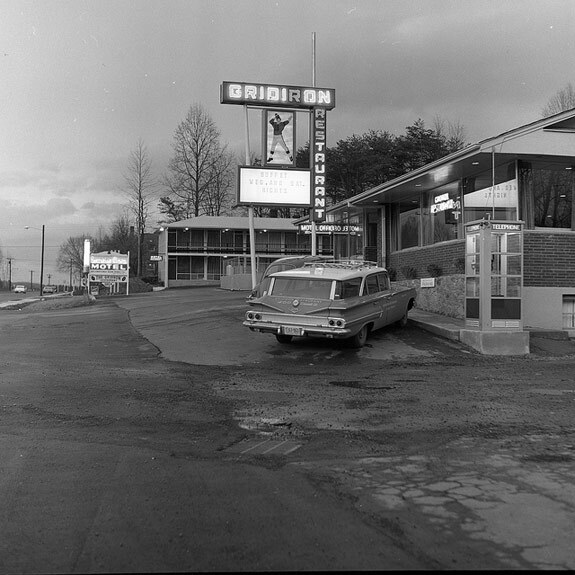 The Gridiron Restaurant is currently the Kabob Palace and the Executive Plaza Motel is now an Econo Lodge. “If you look at the far left of the photograph, you can see the barely used Route 29 North,” says Roseberry. 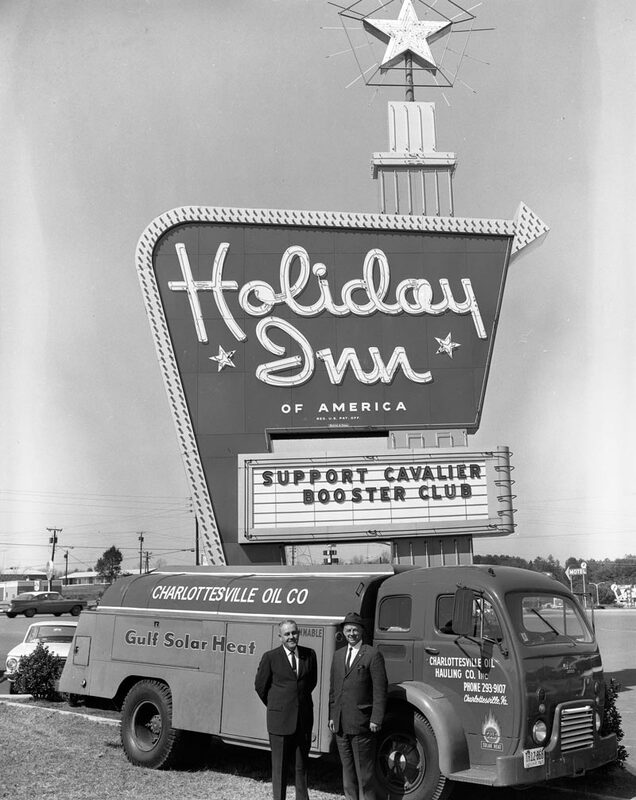 This Holiday Inn still exists on 29 North, next to the Aberdeen Barn and across the road from Best Buy. 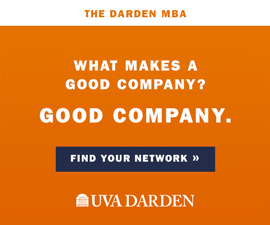 “This was an ad for Charlottesville Oil Company, which was a big supporter of University of Virginia athletic teams,” says Roseberry. 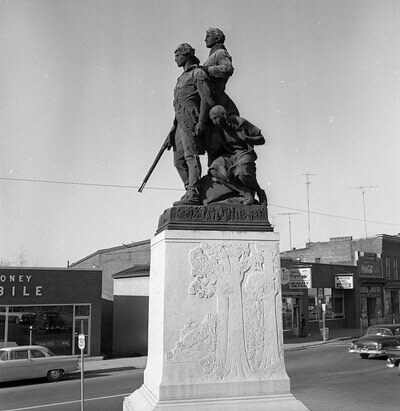 Monument at the intersection of West Main St. and East Main St., then known as Vinegar Hill. 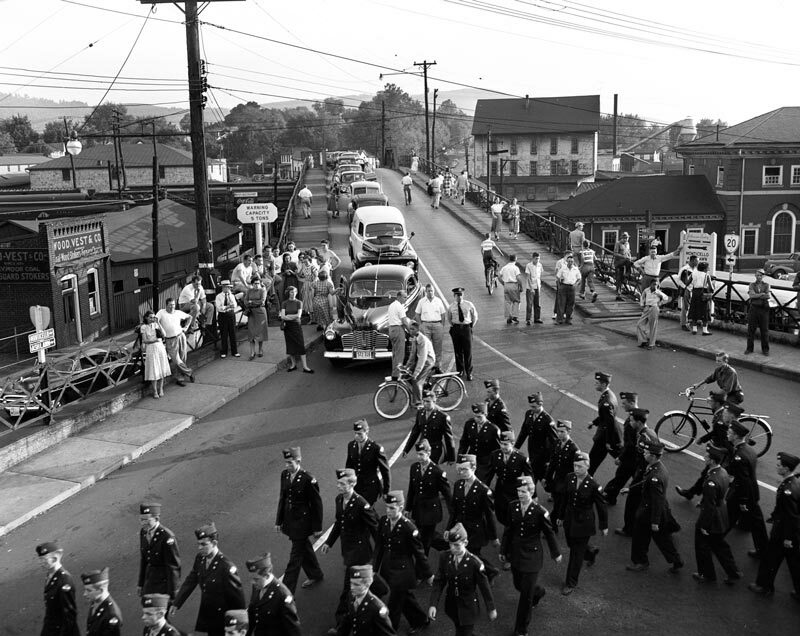 “The buildings at the right of the picture occupy what is now McIntire Rd., which runs through the old Vinegar Hill area,” Roseberry says. 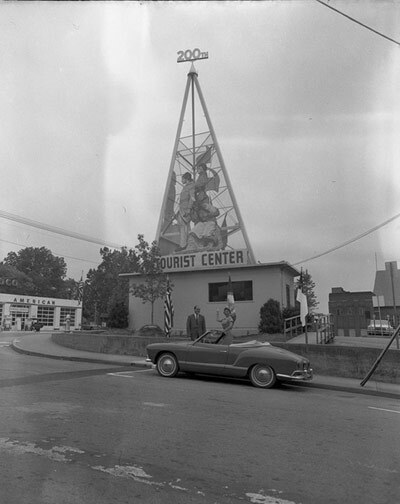 Located near the corner of 7th St. and Market St., this temporary structure was built during the 200th anniversary of Charlottesville in 1962. 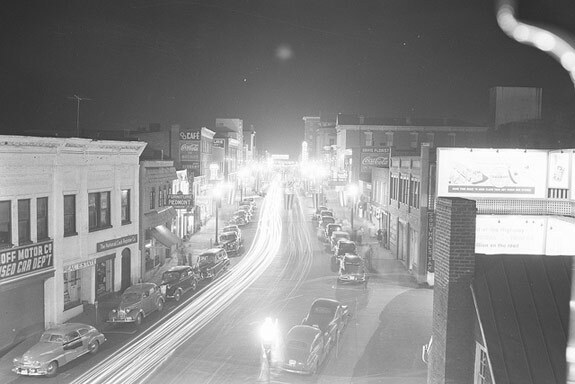 On the site of the demolished Vinegar Hill, looking East down Charlottesville’s Main St. “The land I was standing on when I took this picture is now occupied by the Omni Hotel,” Roseberry says. 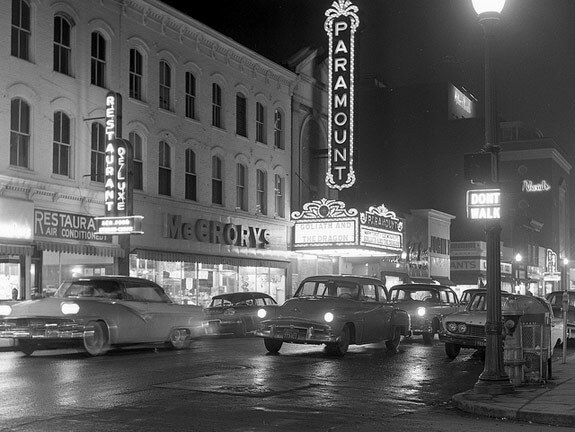 The stores to left of the Paramount Theater burned in 1973. 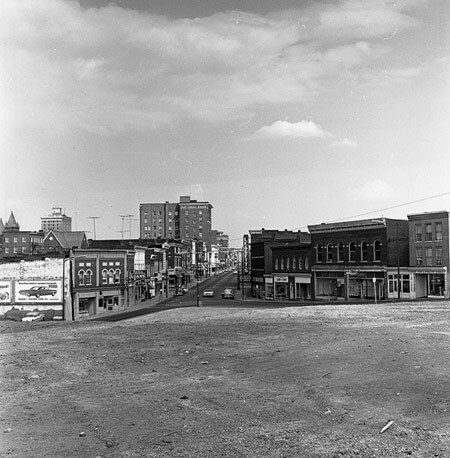 Central Place on the Downtown Mall now occupies the spot where the buildings burned. 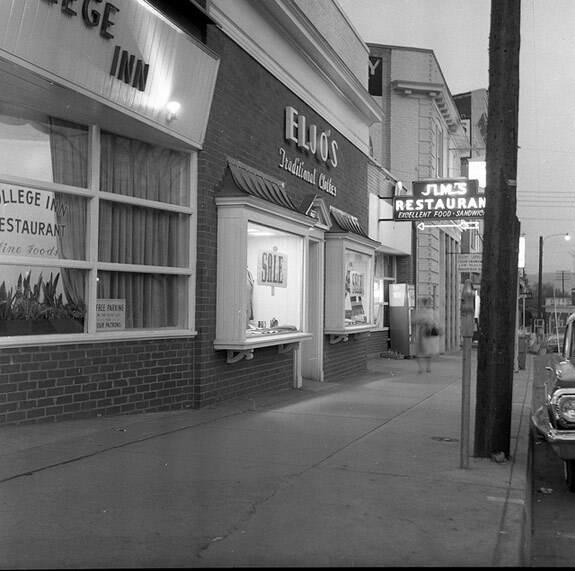 Corner Stores along University Avenue in the 1950s. 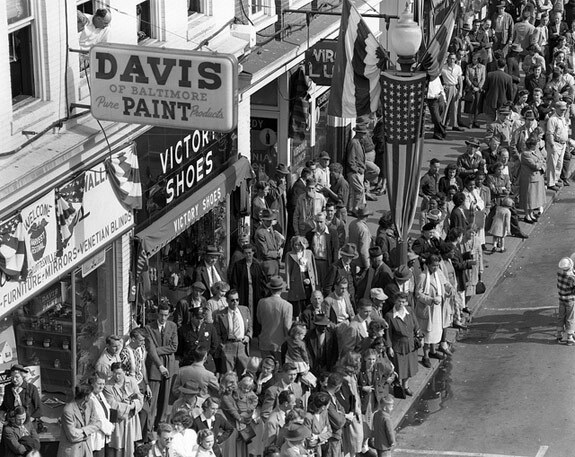 “For a while, I displayed my photographs of big weekends at the University of Virginia in the front windows of Eljo’s,” Roseberry says. 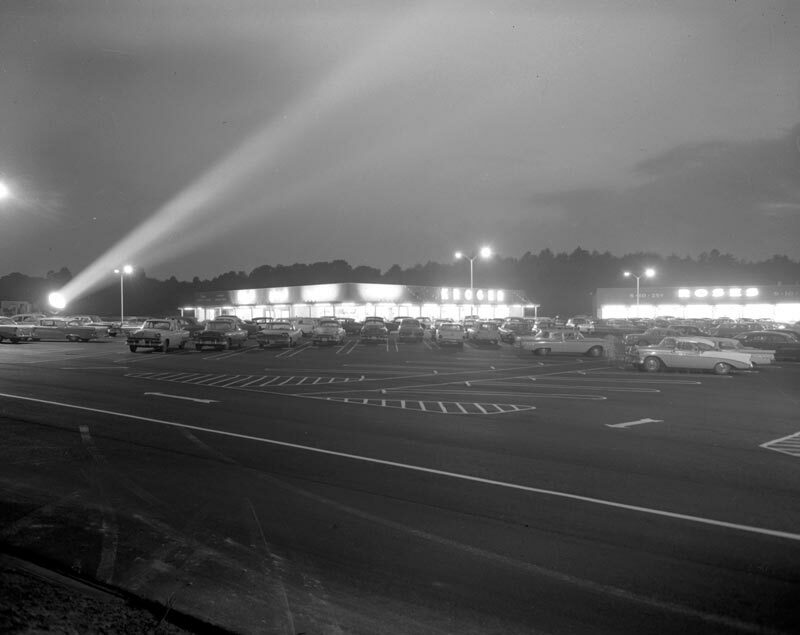 Skylights in operation during opening night of Barracks Road Shopping Center on October 30, 1959—the same night of the Piedmont Airlines crash on Bucks Elbow Mountain near Crozet. “The only surviving passenger on the plane, Phil Bradley, saw those searchlights just before the plane passed over and shortly thereafter hit Bucks Elbow Mountain,” says Roseberry. 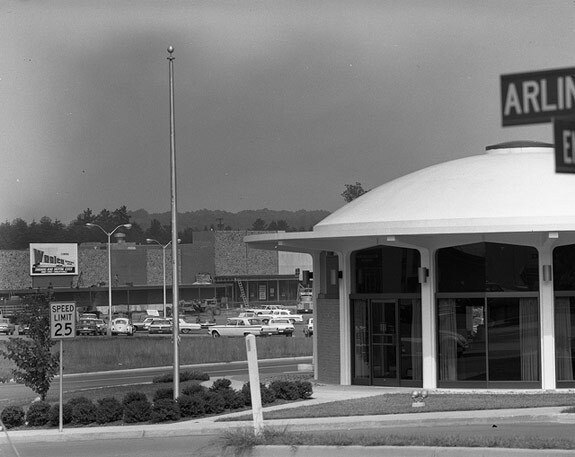 The Kroger location is currently an Old Navy and Roses is now Harris Teeter. 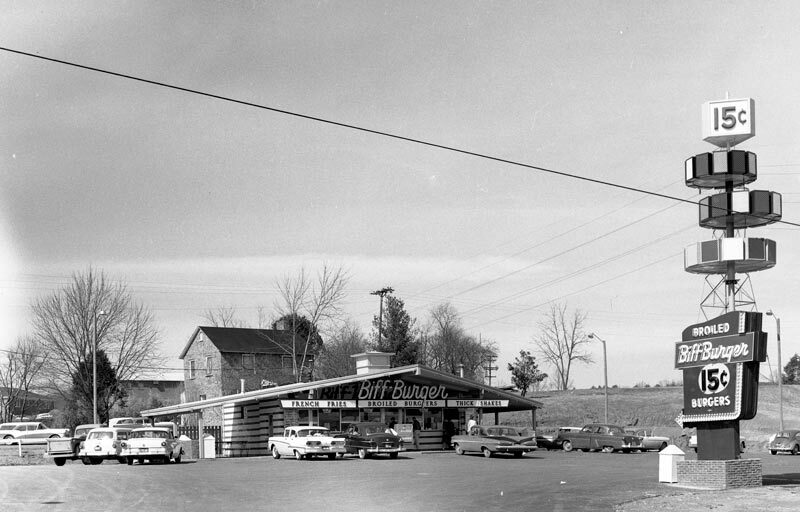 This gas station was recently torn down to make way for more shops at Barracks Road. 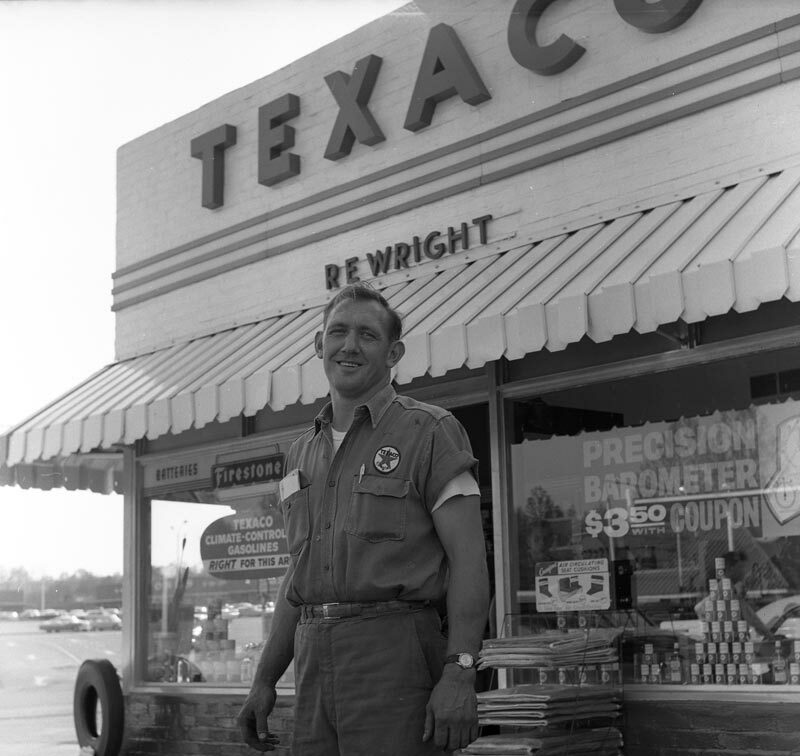 Roseberry believes this is Mr. Wright, the station’s owner. 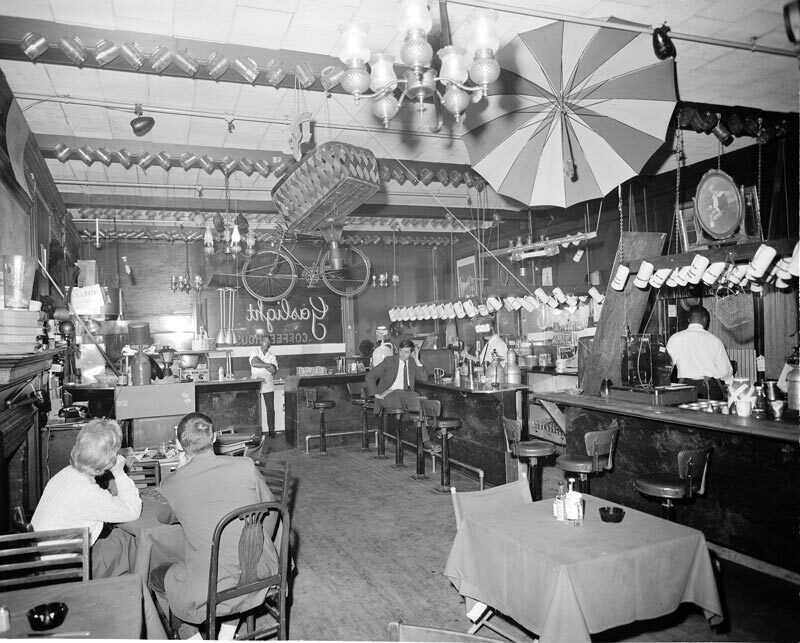 The Gaslight was a popular restaurant for students and locals, located in the old Gleason Hotel, later called the Hotel Albemarle. 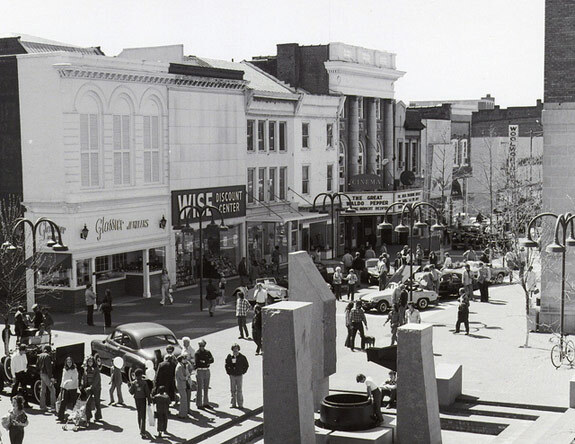 Central Place on the newly converted pedestrian mall in the mid 1970s. 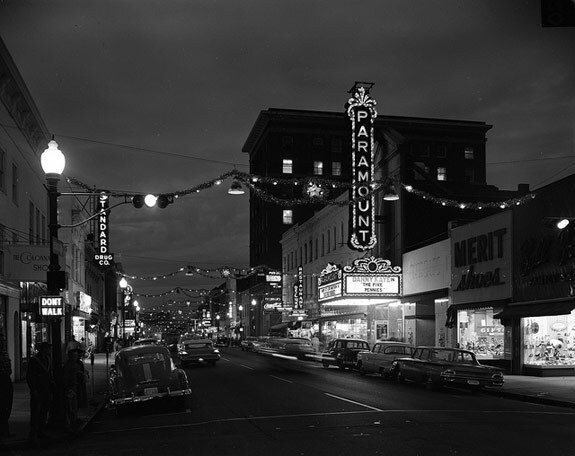 any photos of Pantops Mt circa 1970? 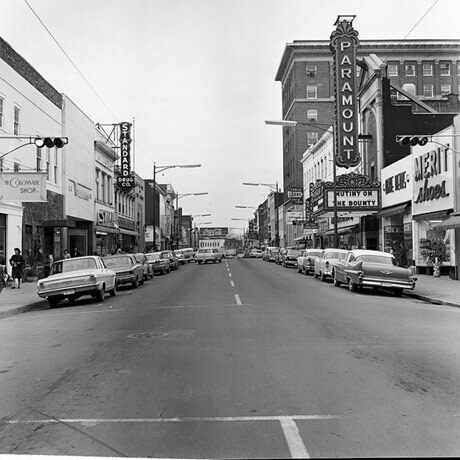 Anyone remember the name of the old brick hotel that sat on the hill maybe behind or above main street? The sour creme and cottage cheese from the Monticello Dairy was something that you just can’t find unless you live in one of those wonderful small towns across our country. He was always “Flash” to me and the brotherhood of ATO. We were at 502 Rugby Road then. 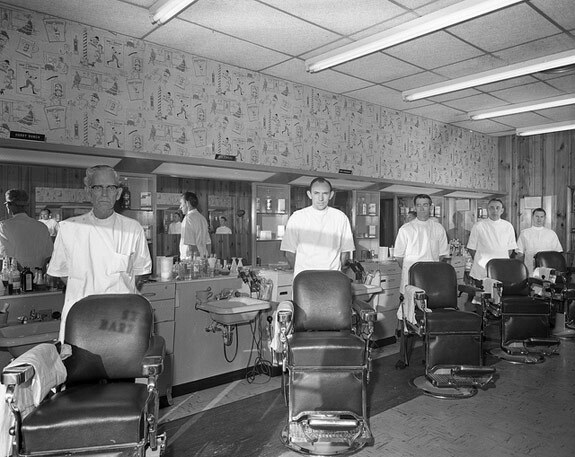 He left prints for sale at Eljo’s and Ed Michtom’s and all the guys would look for pictures of themselves. Several years ago our ATO reunion group invited Ed to our Dinner at Farmington. What a Treasure!